Hall of the Mountain King: Still Spinning: Savatage, "Hall of the Mountain King"
Still Spinning: Savatage, "Hall of the Mountain King"
Editor's note: Still Spinning is an occasional feature where I revisit a record that I consider a classic. It seems only fitting that as I christen the newest version of Hall of the Mountain King, I revisit the record that inspired the site's name way back in its first incarnation in 1997. Just so there's no illusion of objectivity here, I'll go ahead and say before I begin that I'm a complete fanboy. Beyond the name of this site, Savatage's music has inspired me on many levels. It's often on the stereo as I write, and it helped shape my love of metal. 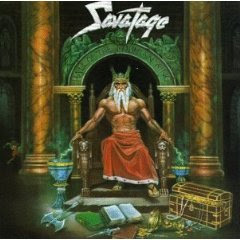 In fact, Savatage is probably one of the three or four most important bands in my collection. But as much as I like all of their records, "Hall of the Mountain King" simply owns everything else they've done. There's not even a remotely weak song on the record from start to finish. Let's start with a certifiable metal classic -- the title track (along with its companion piece "Prelude to Madness.") "Prelude," a metal spin on Grieg's "In the Hall of the Mountain King" builds slowly into a mad frenzy of guitar histrionics that leads to the gut punch of "Hall of the Mountain King." The song, in honesty, didn't need the crashing thunder in the opening because that memorable main riff from Criss Oliva gives it all the thunder and lightning it needs. Jon Oliva's vocals are also at their best on this song -- sinister and sardonic, with the trademark screams and that wicked laugh. On a side note, it was one of the highlights of my year last year when Trans-Siberian Orchestra granted one of my wishes by performing "Prelude to Madness" live. Perhaps it's a little sad, I guess, but when those first thunderbolts struck on the stage, I was like a kid who had just been handed a brand new bag of candy. Still, I wish I could have just gotten one taste of that "Hall of the Mountain King" riff, but alas, no such luck. That two-song set, though, is just the high point of a powerful complete album from start to finish. There's the fairly simple, but very effective riff of "The Price You Pay," which ranks as another of the band's greatest tunes in my opinion. There's also quite a bit of variety on the record, ranging from the soft instrumental "Last Dawn" to the almost pop-rock "Strange Wings" (another great riff) to the full frontal assault of "White Witch." Top it all off with the Jon Oliva screamfest "Beyond the Doors of the Dark" and the dark, almost haunting "Legions," and you have a true metal classic. I'll be honest in saying I don't think Savatage has ever done a remotely bad record (I don't really count "Fight for the Rock" as a Savatage record because it sounds nothing like them), but as much as I love "Gutter Ballet," "Streets" or just about everything else they've done, nothing comes close to touching this record. Criss Oliva's guitar is at its raw best here, untempered, unadulterated power. While it's not as refined or complex as their later records, to me, it's the perfect metal album. Get "Hall of the Mountain King."